Please note: After your purchase is confirmed you will receive a complete tour itinerary with check-in time, location and what to bring. An American sailing vessel, The Dangers Prize, will be the craft that sails you off into the wild, blue, beauty of the sea. The Dangers Prize is what's known as a Skipjack boat. Originally designed to comb oyster beds during the 19th century around the Chesapeake Bay, these boats would sail down to the Florida Keys to double as fishing boats. Skipjacks are designed in a shallow manner that offers a large sail area. providing the perfect environment for backcountry sailing. 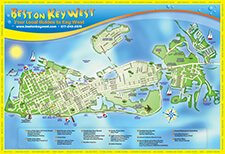 You will experience a unique pleasure as you discover the unseen natural beauty of the Florida Keys under a billowing sail. Despite the wind or the calm weather, you will find yourself fully protected from the waters in your shallow vessel as it guides you through one of nature's most picturesque areas. On your backcountry tour, you will only be visiting the very best snorkeling sites available. We have access to sites that are often inaccessible to others. Sticking to the areas that are only known by the locals, you will have the chance to view the best areas based on the day of your tour. Depending on exactly when you go on your tour, the location will be chosen according to the conditions of the tide and the wind. You will be free from hazardous or overly rough waters during your backwater country snorkeling expedition. Allowing you to visit calm waters ensures visibility and removes the possibility of any form of seasickness for you and your group. In the colder, winter months, wet suits are offered to our guests free of charge. Additionally, prescription strength masks will be offered during these months. In an effort to run a family-oriented business, we go the extra mile to treat you as we would a family member or a close friend. It is our goal to protect you and see that you have an enjoyable trip, which means you will be exposed to only the calmest, crystal blue waters of the sea. The Mangrove Islands await you in this backcountry kayaking expedition. You will have chance to travel with a knowledgeable and friendly guide that will help you explore the vast and wondrous islands. As you explore the area you will experience all there is to see in this sensitive yet beautiful ecosystem on Mangrove Island. Canopied canals serve as your stream, as you paddle through the beautiful ecological wonder and view tropical birds, sharks, sport fish, and other plants and animals. Do not give it a second thought if you have never been in a kayak previously. We offer the top of the line sea kayaks. These stable vessels will suit anyone no matter their age or experience level and with the help of your trusty companion guide, you will be sure to be paddling with the best of them in no time! Found a better price online? We will price match it. Just call our Activity concierge and ask for our price matching special. Limited Spaces Available! For reservations call . Spaces are extremely limited this time of year so book early to ensure the date you want.